Tetralogy of Fallot is the most common type of cyanotic congenital heart disease. It consists of a right ventricular outflow tract obstruction, a malalignment ventricular septal defect, an overriding aorta, and right ventricular hypertrophy, as demonstrated in the image below. Magnetic resonance image of the heart in an infant with tetralogy of Fallot. This image shows a large ventricular septal defect and right ventricular hypertrophy. Note the descending aorta is on the right, consistent with a right-sided aortic arch. In the postoperative evaluation, echocardiography and MRI are preferred. [6, 7, 3, 8, 9, 10, 11] The choice of imaging examinations depends on their availability and clinical preference. Echocardiographic findings are diagnostic of intracardiac abnormalities, but echocardiography is limited in the evaluation of the peripheral pulmonary arteries and collateral flow. If the confluence or presence of the branch pulmonary arteries is in doubt after echocardiography, perform MRI or angiography. Patient Education: For excellent patient education resources, visit eMedicineHealth's Heart Health Center. Also, see eMedicineHealth's patient education article Tetralogy of Fallot. On radiographs, the cardiac silhouette in patients with tetralogy of Fallot is normal in size; however, right ventricular hypertrophy can elevate the left ventricle. Combined with a small or absent main pulmonary artery segment, the heart can have the classic boot-shaped appearance (as seen in the image below). Most children with tetralogy of Fallot do not have boot-shaped heart. Radiograph of a boot-shaped heart in an infant with tetralogy of Fallot. Typically, the appearance of the vascularity of the pulmonary artery is reduced, but it can also be normal. Decreased pulmonary vascularity is frequently difficult for the general radiologist to appreciate. Large collaterals may give the appearance of normal vascularity. 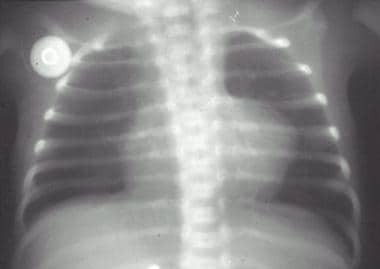 The enlarged aorta in children with a right-sided arch can cause airway compression that can be identified on chest radiographs, as demonstrated in the images below. A right-sided arch is present in 25% of children with tetralogy of Fallot, and it can be identified by means of direct visualization, with displacement of the trachea to the left or with increased opacity of the spinal pedicles on the ipsilateral side of the aortic arch. The position of the aortic arch influences surgical planning because Blalock-Taussig shunts are more easily placed on the contralateral side of the aortic arch. Modified Blalock-Taussig shunts can be placed bilaterally. 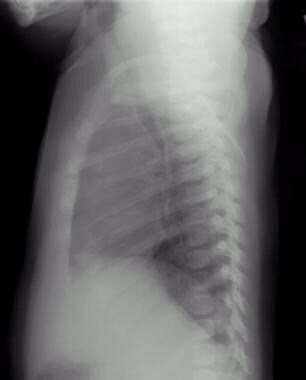 Radiograph of an infant with tetralogy of Fallot and a right-sided aortic arch. 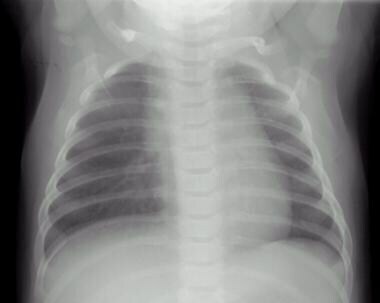 Radiograph of an infant with tetralogy of Fallot (same patient as in the previous image). Note the anterior compression of the trachea by the large ascending aorta. Confidence in conventional chest radiographic findings increases with the radiologist's reading experience. The use of echocardiography has reduced the importance of chest radiography in the initial diagnosis of congenital heart disease. Echocardiography should be used to confirm radiographic findings that are suggestive of tetralogy of Fallot. The boot-shaped heart is overlabeled in neonates, who normally have right ventricular hypertrophy. If the chest radiograph shows lordosis, a normal heart may appear boot shaped. A right-sided aortic arch in a child with congenital heart disease is most commonly associated with tetralogy of Fallot. Children with a large right-sided aortic arch may have a double aortic arch or an aberrant left subclavian artery without congenital heart disease. Other forms of cyanotic heart disease that are associated with a right-sided aortic arch are usually hypervascular and associated with cardiomegaly (eg, truncus arteriosus, transposition of the great arteries). Although cyanosis and a right-sided aortic arch are associated with tetralogy of Fallot, the presence of cardiomegaly and increased pulmonary vascularity make an admixture lesion the more likely diagnosis. Transposition of the great vessels or truncus arteriosus is associated with increased pulmonary vascularity, cardiomegaly, and cyanosis, as well as a right-sided arch. Approximately one third of children with truncus arteriosus have a right-sided aortic arch. Only 5% of children with transposition of the great vessels have a right-sided aortic arch, but this is a more common form of congenital heart disease than truncus arteriosus. 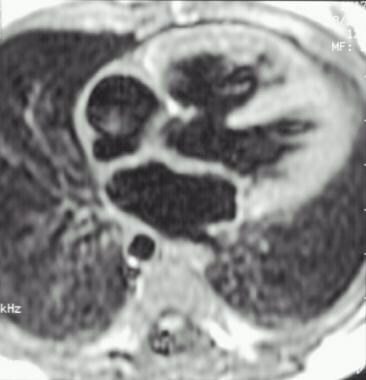 Computed tomography (CT) scanning has an infrequent role in the evaluation of tetralogy of Fallot. [12, 13] This modality is useful for the evaluation of surgical complications such as infection or pseudoaneurysm formation. Helical CT scanning can be used to identify airway compression that is caused by a large ascending aorta that is associated with tetralogy of Fallot. The confluence, presence, and size of the branch pulmonary arteries can be identified (see the image below). MRI measurements of the size of the pulmonary and branch pulmonary arteries are as accurate as angiographic measurements, and they can be used to calculate the McGoon ratio and the Nakata index. Magnetic resonance image of tetralogy of Fallot in an infant. 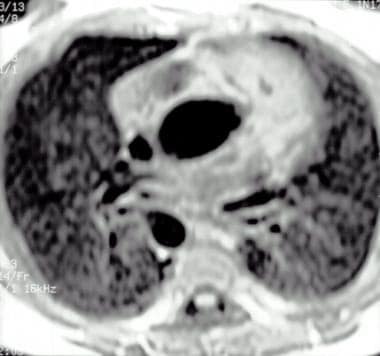 This image shows a large ascending aorta and the presence of pulmonary atresia. The oval shape of the descending aorta is secondary to large collateral vessels. Experienced operators are required for a high-quality MRI evaluation. If properly performed, MRI can replace preoperative angiography, which is more invasive. Oblique imaging with thin sections may be necessary to verify pulmonary arterial confluence and identify hypoplastic pulmonary arteries in neonates and infants. Flow analysis of pulmonary regurgitation is susceptible to aliasing if the velocity encoding is too low. Echocardiography is the primary imaging method for examining a child in whom tetralogy of Fallot is suspected. [7, 4, 5] Intracardiac anomalies, including pulmonary infundibular and valvular stenosis and the position of the aortic root overriding the ventricular septal defect, are identified with 2-dimensional echocardiography. The origins of the coronary arteries can also be identified. Doppler ultrasonographic examination of the pulmonary outflow tract can be used to measure the velocity gradient in the right ventricular outflow tract and to differentiate severe stenosis from atresia. Continuity of the branch pulmonary artery with the main pulmonary artery can be identified, and the size of the branch pulmonary arteries can be measured. The initial placement of palliative shunts is likely in children who have small branch pulmonary arteries in order to allow the pulmonary arteries to grow before corrective surgery. The full length of the shunts may not be visible; however, Doppler ultrasonography can be used to verify shunt patency, even when the entire length of the shunt cannot be imaged. Intracardiac and central pulmonary artery abnormalities are identified in the presurgical patient with a high degree of confidence. Ultrasonographic windows in the older child and young adult limit the usefulness of echocardiography in postoperative follow-up imaging. Postoperative fibrosis in the mediastinum also reduces the effectiveness of echocardiography. The pulmonary arteries and systemic-pulmonary arterial shunts are difficult to evaluate after surgery in children. Pulmonary regurgitation, a common complication of corrective surgery, is better evaluated with MRI. 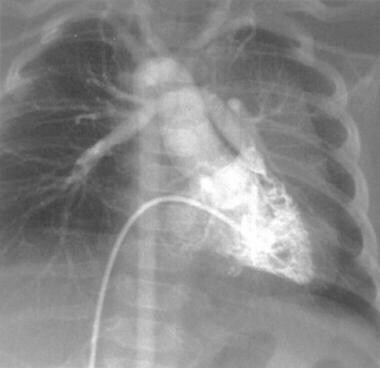 Angiogram in an infant with tetralogy of Fallot and a right-sided aortic arch. This image shows the pulmonary artery is hypoplastic, and the branch pulmonary arteries have a characteristic seagull appearance. Catheter studies remain the criterion standard for blood pressure measurements and morphologic imaging of the coronary and branch pulmonary arteries. Noninvasive techniques are preferred when they are available so that vascular access for potential future interventional procedures is preserved. Unlike inherently tomographic studies such as echocardiography, MRI, and CT scanning, angiography may be limited by overlapping structures that may obscure other structures, despite the use of multiple planes. Grotenhuis HB, Mertens LL. Recent evolutions in pediatric and congenital echocardiography. Curr Opin Cardiol. 2015 Jan. 30 (1):118-24. [Medline]. Han BK, Lesser JR. CT imaging in congenital heart disease: an approach to imaging and interpreting complex lesions after surgical intervention for tetralogy of Fallot, transposition of the great arteries, and single ventricle heart disease. J Cardiovasc Comput Tomogr. 2013 Nov-Dec. 7 (6):338-53. [Medline]. Ramakrishna H, Feinglass N, Augoustides JG. Clinical update in cardiac imaging including echocardiography. J Cardiothorac Vasc Anesth. 2010 Feb 16. [Medline]. Grison A, Maschietto N, Reffo E, et al. Three-dimensional echocardiographic evaluation of right ventricular volume and function in pediatric patients: validation of the technique. J Am Soc Echocardiogr. 2007 Aug. 20(8):921-9. [Medline]. Lim DS, Dent JM, Gutgesell HP, Matherne GP, Kron IL. Transesophageal echocardiographic guidance for surgical repair of aortic insufficiency in congenital heart disease. J Am Soc Echocardiogr. 2007 Jun 19. epub ahead of print. [Medline]. Fratz S, Schuhbaeck A, Buchner C, Busch R, Meierhofer C, Martinoff S, et al. Comparison of accuracy of axial slices versus short-axis slices for measuring ventricular volumes by cardiac magnetic resonance in patients with corrected tetralogy of fallot. Am J Cardiol. 2009 Jun 15. 103(12):1764-9. [Medline]. Iriart X, Montaudon M, Lafitte S, Chabaneix J, Réant P, Balbach T, et al. Right ventricle three-dimensional echography in corrected tetralogy of fallot: accuracy and variability. Eur J Echocardiogr. 2009 Aug. 10(6):784-92. [Medline]. Kohi MP, Ordovas KG, Naeger DM, Meadows AK, Foster E, Higgins CB. CMR assessment of right ventricular function in patients with combined pulmonary stenosis and insufficiency after correction of tetralogy of Fallot. Acta Radiol. 2013 Jul 17. [Medline]. Sadeghpour A, Kyavar M, Madadi S, Ebrahimi L, Khajali Z, Alizadeh Sani Z. Doppler-derived strain and strain rate imaging assessment of right ventricular systolic function in adults late after tetralogy of Fallot repair: an observational study. Anadolu Kardiyol Derg. 2013 Jul 4. [Medline]. Koca B, Oztunç F, Eroglu AG, Gökalp S, Dursun M, Yilmaz R. Evaluation of right ventricular function in patients with tetralogy of Fallot using the myocardial performance index and isovolumic acceleration: a comparison with cardiac magnetic resonance imaging. Cardiol Young. 2013 May 17. 1-8. [Medline]. Ordovas KG, Muzzarelli S, Hope MD, Naeger DM, Karl T, Reddy GP, et al. Cardiovascular MR Imaging after Surgical Correction of Tetralogy of Fallot: Approach Based on Understanding of Surgical Procedures. Radiographics. 2013 Jul. 33(4):1037-52. [Medline]. Chen SJ, Lin MT, Lee WJ, et al. Coronary artery anatomy in children with congenital heart disease by computed tomography. Int J Cardiol. 2007 Sep 3. 120(3):363-70. [Medline]. Siriapisith T, Wasinrat J, Tresukosol D. Uncorrected pink tetralogy of Fallot in an adult patient: Incidental CT findings. J Cardiovasc Comput Tomogr. 2009 Aug 7. [Medline]. Oosterhof T, van Straten A, Vliegen HW, et al. Preoperative thresholds for pulmonary valve replacement in patients with corrected tetralogy of Fallot using cardiovascular magnetic resonance. Circulation. 2007 Jul 31. 116(5):545-51. [Medline]. Bernardes RJ, Marchiori E, Bernardes PM, et al. A comparison of magnetic resonance angiography with conventional angiography in the diagnosis of tetralogy of Fallot. Cardiol Young. 2006 Jun. 16(3):281-8. [Medline]. Holzer RJ, Sisk M, Chisolm JL, Hill SL, Olshove V, Phillips A, et al. Completion angiography after cardiac surgery for congenital heart disease: complementing the intraoperative imaging modalities. Pediatr Cardiol. 2009 Nov. 30(8):1075-82. [Medline]. Bardo DM, Asamato J, Mackay CS, Minette M. Low-dose coronary artery computed tomography angiogram of an infant with tetralogy of fallot using a 256-slice multidetector computed tomography scanner. Pediatr Cardiol. 2009 Aug. 30(6):824-6. [Medline].